This morning I met Chad and Goody at the Great Salt Lake Marina for a swim. It's been a while since I've swam with Goody and it was good to see him. Chad and I will be racing at Bountiful Lake tonight and, by swimming this morning, we will be able to check off the "swim in two bodies of water (not pools) in the same day" square on the SLOW Check-Off Challenge. The water was really warm (80 degrees in some spots). This may be my last swim out here for a while. The water was very clear and we could see the bottom most of the swim. We swam from Silver Sands to the end of the buoy line and then out into the lake to another set of red and green buoys. The distance was almost exactly a mile, which is good to know. From there we swam back towards the red buoys outside the breakwall. We took a few minutes to look at the shipwreck, and then headed back to Silver Sands, making a big triangle. 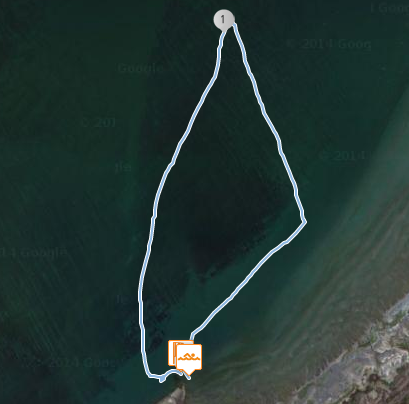 I took this swim really easy, using it as a warm-up for the race tonight. I'm hoping to be able to break the current men's record for the course, but I hear there may be some really fast guys coming.